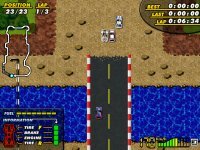 After our remake of Road Fighter in 2003 we decided was time to remake another racing game. 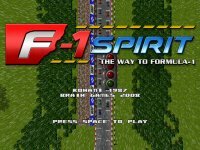 This time we chose for Konami's MSX1 classic F1-Spirit! In only three months of development time, the game had to be finished. When you read this, the competition has already ended. Out of 73 submitted entries, we finished at the 13th place. Of course you can read what the judges had to say about our remake. 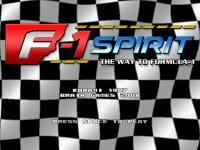 If you have any problems, questions or suggestions about F-1 Spirit, feel free to join us at the Braingames forums, or even better, at the F-1 Spirit forum. The forum is the place where you can find the latest developments, send us your contributions, send us fanmail or for just a friendly chat. You're welcome to join us! After participating in the Retro Remakes competition in 2003 with our Road Fighter remake (which finished 7th out of 83 entries), we decided to give the 2004 competition a shot as well. Apparently we like racing games a lot, so after some voting we chose to remake the Konami MSX1 classic F-1 Spirit. After 3 months of hard work and barely making both the deadline and file size limit, our contribution to the competition was ready. When finally the judges reviewed all games and passed their judgements, we ended at the 13th place out of the in total 73 entries. But... because we finished the remake in a hurry we're not fully satisfied with the current state of the remake. That's why we are still working on it (sometimes), adding more features like graphical effects, more and better music and graphics, and maybe even network play in the future. So... no, the project isn't entirely dead and finished yet! Nontheless the remake is fully playable already. Here you can see some screenshots of the game in action. There's more information on the about page. 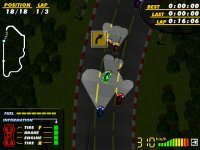 The F-1 Spirit remake is available for Windows, Mac OS X and Linux computers. We provide binary versions for both Windows and OSX, for Ubuntu/Debian you can download a .deb file. For Linux or other OSes you can find the source code for the game in the last download. You can download the remake from our primary server or our mirror. File size is about 18MB. Also try the nightly SVN exports for the most current version. The most important one: the brake is your best friend, especially in the F1 tracks! Use the PIT STOPS if your car has a lot of damage. For instance your top speed will decrease if the engine is damaged. This will make you lose time in every lap. When you are in the PIT STOP you can hold down the DOWN key to speed up car repairs. Fuel intake will be slower, though. The fuel consumption is determined by the RPM meter (as in real cars). Your car only consumes fuel when you accelerate. Keep these two things in mind while you race to save fuel. F1 tracks cannot be won at the first race unless you are an ACE driver. 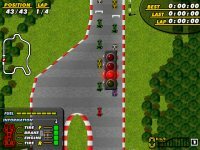 To win an F1 race, try to memorize each curve and play each race several times to know where where to brake and where to accelerate. Here you can see the hiscores of the best players of F-1 Spirit. Join the race and submit your own scores!